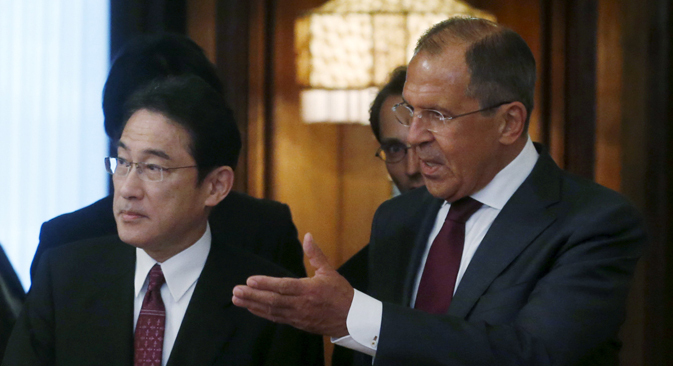 Russian Foreign Minister Sergei Lavrov (R) gestures to his Japanese counterpart Fumio Kishida ahead of their meeting in Moscow, Russia, September 21, 2015. Moscow has announced an upcoming visit of Russian Foreign Minister Sergei Lavrov to Japan. “An agreement has been reached to organize an official visit of Russian Foreign Minister Sergei Lavrov to Japan in the middle of April of this year," the Russian Foreign Ministry said in a statement published after Russian-Japanese foreign office consultations held in Tokyo on Feb 15.